Back in the golden era when I had free time, I was sometimes fortunate enough to volunteer for Heather Ross weekend workshops. During one of these workshops, I met Annabel Wrigley (who is probably best known for her “We Love to Sew” books for children sewists.) She is one of those lovely people where you question if they’re real or if they hide in their room and curse a whole bunch when no one is looking because how can anyone possibly be THAT nice? 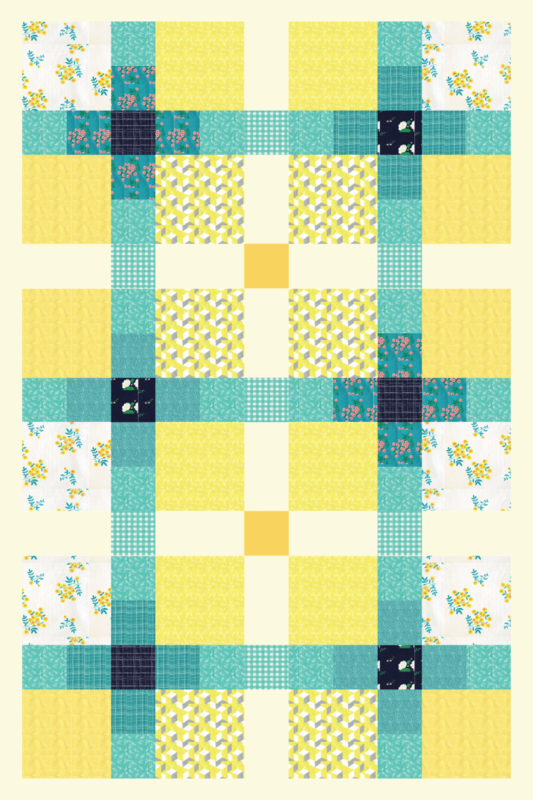 Needless to say, I adore Annabel and so when it came to my attention that she has a new fabric line, “Maribel” with Windham Fabrics and she asked me to create a quilt using it, I of course said HECK YES! So last fall, I drove down to Virginia to spend the day with her in her absolutely adorable space, Little Pincushion Studio. After getting sidetracked by all the things her students had made, we sat down with the fabric and spent the day designing quilts. It was all kinds of amazing. 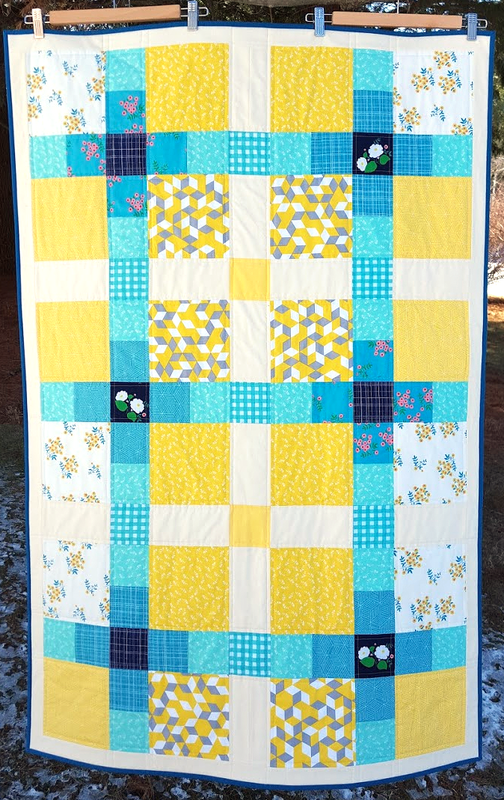 Her collection is filled with flowers and geometrics, and when I saw the yellow and turquoise color ways, I immediately thought of picnics during the spring. 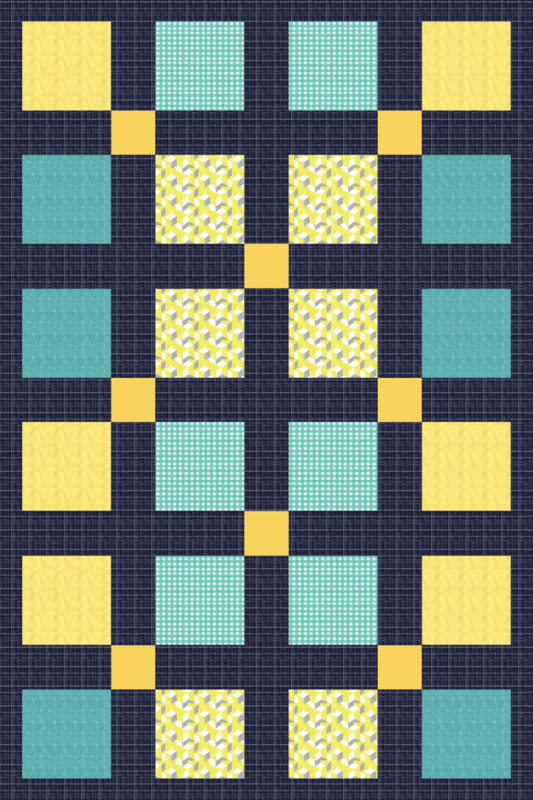 Picnics always make me think of plaid for some reason (probably because I have a plaid problem) so I came up with this super quick and easy baby picnic quilt pattern (pdf download). It uses strip piecing so the top comes together quite quickly. As with all my patterns, I included sketches of a couple variations and a coloring sheet. And for those who are looking for something a bit more graphic and modern, there is this variation which is more modern. And a lot less plaid. Maribel will be arriving in stores in August. And when it does, I’ll probably be picking up more of this print because the colors are so pretty together. Thank you Annabel for the chance to create using your fabrics! I can’t wait to see what everyone makes with them! Testing begins on a new design tool! I hope you are taking your picnic quilt and going to the Mall in DC to watch the fireworks on the 4th. Long been on my bucket list. Will you be my surrogate? Lovely colors in your “Picnic Plaid”. Long been favorites of mine too. Awwww, we didn’t end up going to the mall for the 4th of July. I think I was working. Or it was raining. Or probably both. I don’t always make the best life choices. Picnics and plaid definitely go together! I really love the colorway and the way your design lets each of the prints have its moment. 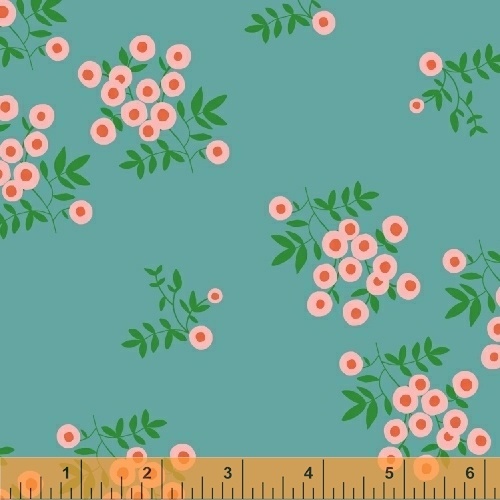 I love the pattern and the fabrics are just lovely! Thank you! Annabel did a great job choosing the colors in her line. 🙂 Definitely made it a lot of fun to play with pattern and design! Super cute! I do love a good plaid…. Hah! I’m glad it’s not just me that is drawn to plaid. 🙂 It’s such a fun design element to play with! Lovely quilt! Thanks for sharing the pattern. I love the length of this. I was just listening to an interview on Pat Sloan’s podcast with Ms. Wrigley– she does seem very nice! Thank you so much! 😀 I need to check out that interview, I saw it come by but didn’t get a chance to listen and then of course forgot. Annabel is truly lovely, I just want to hang out with her and figure out how she does it all!